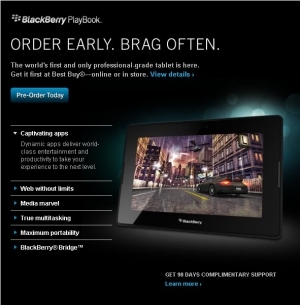 Best Buy taking pre-orders for the BlackBerry PlayBook | BlackBerry Blast! Customers eagerly awaiting the BlackBerry PlayBook tablet can begin placing their orders today. Research In Motion and Best Buy, a preferred retailer for the BlackBerry PlayBook, today announced the pricing and launch date for the highly anticipated tablet in the U.S. and Canada.